Shape: Frog shape, with a simple twist of their flexible, bendable arms and legs. Moulds into any shape and position. Ideal for supporting climbing plants. Can also be used as a decorative item to hang off of pots, wrap around pencils, hook on shelves etc. 2pcs per pack, 10pcs in total. 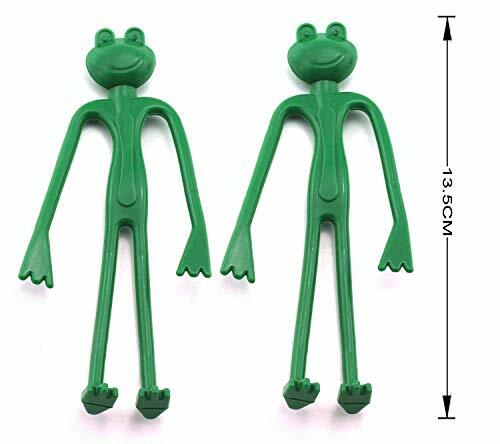 Frog shape fun and flexible plant tie, with a simple twist of their flexible, bendable arms and legs. Advantage: Weatherproof rubber coating; Bendable and Reusable; Moulds into any shape and position. Function: Can be used to secure canes and plants; Support plants without causing damage; Ideal for supporting climbing plants. Application: For use outdoors and indoors; Can be wrapped around plant stems for decoration purposes; Can also be used as a decorative item to hang off of pots, wrap around pencils, hook on shelves etc. Package: 2pcs per pack, 10pcs in total. Zyanwa Foam Ties Roll 32-1/2' L, Garden Plant Twist Tie Strips, Green Color Twist Tie.